Walking around the farmer’s fields gives a different perspective on things. The view is quite different up close compared to what you see zipping down the highway. From afar you see the contents of the farmed field, what’s growing or what’s being planted or harvested. Neat rows of corn or soybeans. Perhaps a few white-tailed deer or a flock of turkeys. On closer inspection one sees a host of wild plants at the edge of the fields. Most would be called roadside weeds, but when seen up close their true beauty can be enjoyed. Oxeye daisies, butter-n-eggs, Venus’s looking glass, black mustard, deptford pink, and even crown vetch lend a pastel rainbow to the fields’ edge with various shades of yellow, orange, pink, purple and white. Today, I spotted a type of rose flowering on the west side of a soy field where the field meets the woods. It had five pink petals with many yellow stamens and uniformly toothed leaflets. 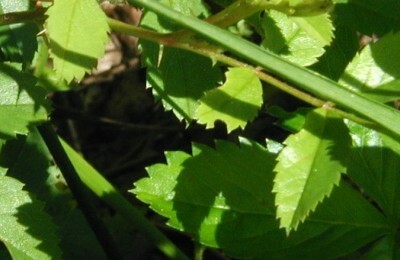 One or two long, straight prickles at the base of each compound leaf helped to identify the plant as a Pasture Rose, Rosa carolina, also called Carolina Rose. 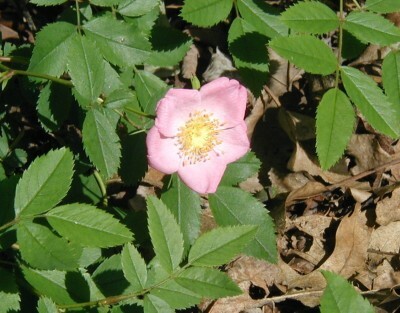 The pink, five-petaled Pasture Rose as seen at the edge of the woods. Toothed leaflets of pasture rose and it’s long, straight “thorns” (in the upper center and upper left). Pasture rose in soft pink and yellow. 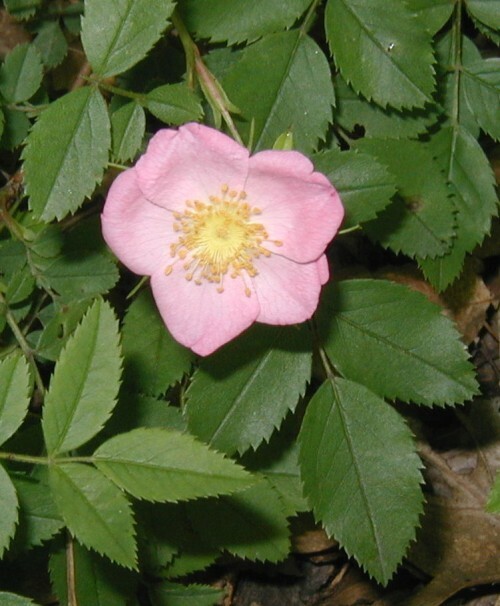 Here in Pennsylvania the pasture or carolina rose will be blooming in June and July. Do any of you find this plant blooming later in July? If you’re going out there to check it out, be careful of the poison ivy as it’s typically found in the same habitat. Leave a comment to let us know what you find!